Pancake – Paws & Claws Adoptions Inc. This beautiful 3 year old girl has come to us from a neglect situation, and as a result has some blotchy scars on her nose and lower lip that will never grow hair again. This will mean she is strictly an inside only cat due to the risk of her getting skin cancer. Pancake is a beautiful, friendly loving cat who gets along with other cats, however prefers to have her people all to herself, while she spoils you with cuddles, purrs and affection. She is fine with all other pets. 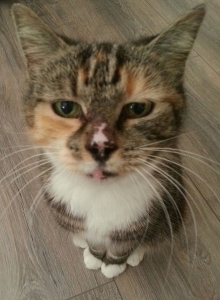 Pancake’s adoption does come with some conditions; due to some medical issues that will require monitoring her adopter must keep in contact with her foster carer and inform the carer of any changes to Pancake’s behaviour immediately. These medical issues do not affect her personality in any way! Please feel free to contact Pancake’s carer on 0451436592.